When you need to refurnish your office, think about the table that will provide the most appeal to your office. Even though it is used, all of our pre-owned furniture will be polished for an elegant shine before delivery. Purchasing used office furniture is a great option to have affordable office decoration and a good cut of the budget. Thereby, while buying the used office tables, you should consider a number of facts and act accordingly to get the best deal. When you need to refurnish your office, think about the table that will provide the most appeal to your office. Even though it is used, all of our pre-owned furniture will be polished for an elegant shine before delivery. Your office table shouldn’t be picked to just match with the chairs only. Also decide which style you are going to pick for the table. Mostly, take in consideration your use of purpose, interior and spacing of the office room and outlook of the table. Is the Table The Right Size? The fastest way to find the office table of right size is to calculate the allocated space. For conference room, board room, directorate room and for other rooms, the size of the used office table wil definitely varies. Another important thing is, while taking measurements of the allocated space, allow a 90 cm gap between the wall and the table edge. As long as functionality is concerned, you should obviously consider the material quality and sustainability of the material. Used office tables are going to serve the purpose for a long period of time. So consider the maximum stress it can survive and the structural strength of the used tables as well. We provide delivery straight to your building, and depending on your needs we offer installation services, all at a fantastic price. The quality of the wood from our top name brands offers exceptional durability. 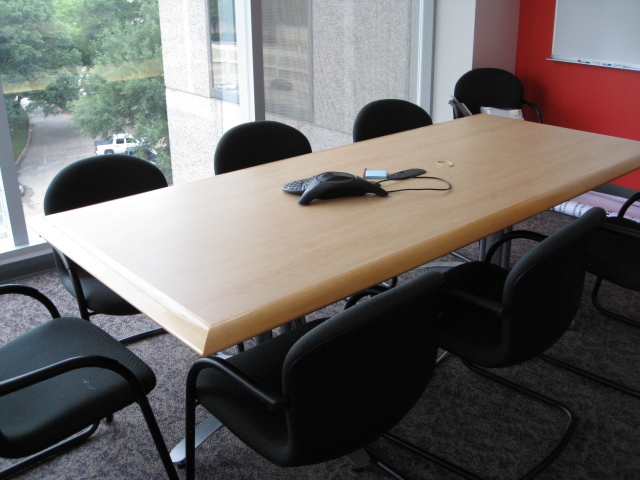 Boardroom tables serve a variety of purposes, so make sure your first impression is lasting with furniture from one of Houston’s most reliable office furniture companies. Our complete customer service means you don’t have to worry about getting that extra-large 30 foot conference table through your door.